Presqu’ile Provincial Park near Brighton, Ontario is one of the easiest to visit and one of the most accessible parks in Ontario. This small but picturesque Ontario Provincial Park packs loads of charm. Presqu’ile Provincial is often overlooked by those looking for more popular small Ontario parks such as Bon Echo PP and Sandbanks PP. 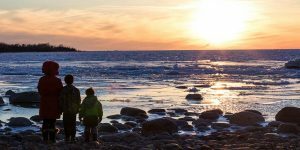 For those looking for a weekend getaway, Presqu’ile makes for a great place for families and couples alike. Here is why we love Presqu’ile Provincial Park so much. Presqu’ile Provincial Park is a popular destination for day trips and picnics. 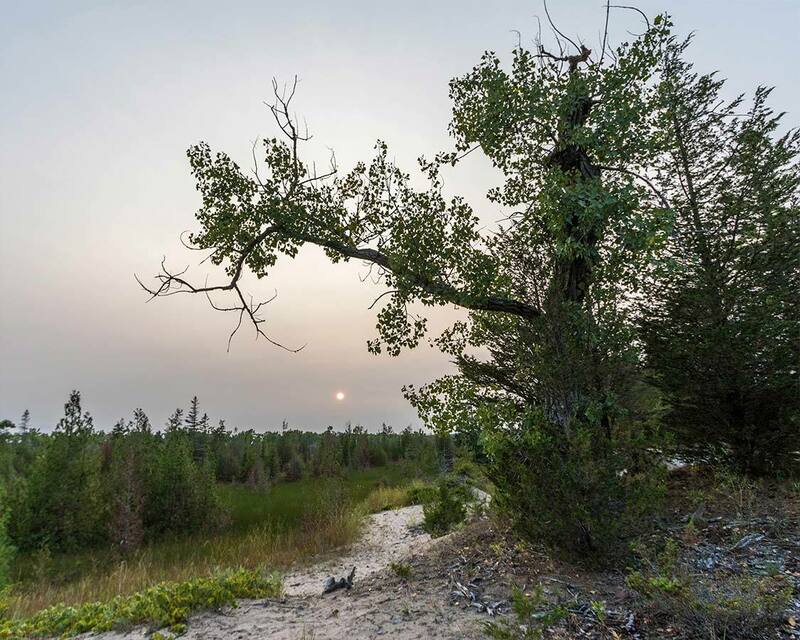 The park features 2.5 km of beach, 16 km of trails, a marsh boardwalk, nature centre, two visitors centres, and the second oldest operating lighthouse in Ontario. Presqu’ile is also a popular destination for bird lovers. It’s a world-class destination for the spring bird migration, and there are over 330 species of birds recorded in the park. 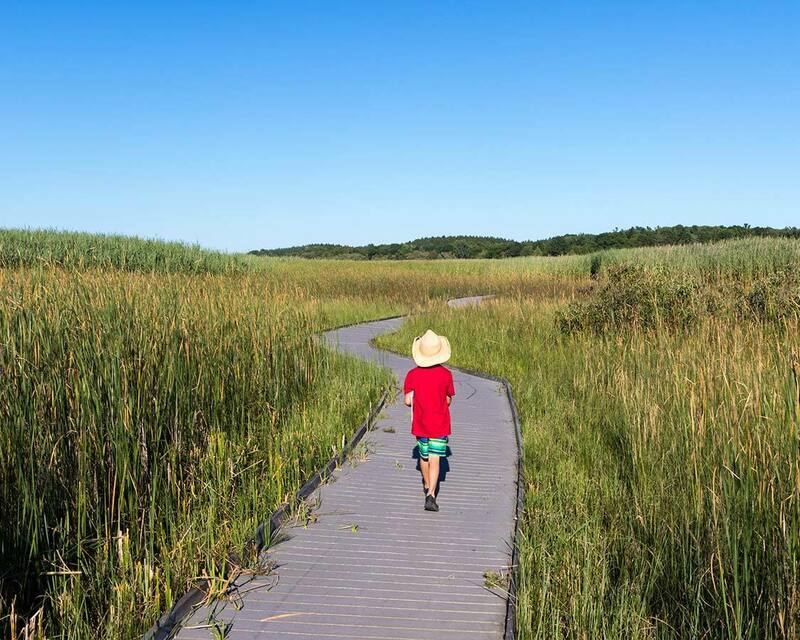 Is Presqu’ile Provincial Park Good for Families? Presqu’ile is French which means “almost an island”. And driving through this L-shaped peninsula will make the reason for that name very obvious. The park is attached to the mainland by a thin strip of land. The currents of Lake Ontario have poured sand along the ridge until, over thousands of years, the area surrounding the park has grown. Walking through Presqu’ile Provincial, you can see where the beaches have been at various times over the last few thousand years. Some have grown over with lush greenery. Others remain as sand dunes dotted with grasses and small trees. Presqui’le Provincial Park is about 150 km east of Toronto. It is just west of Prince Edward County along Highway 401. 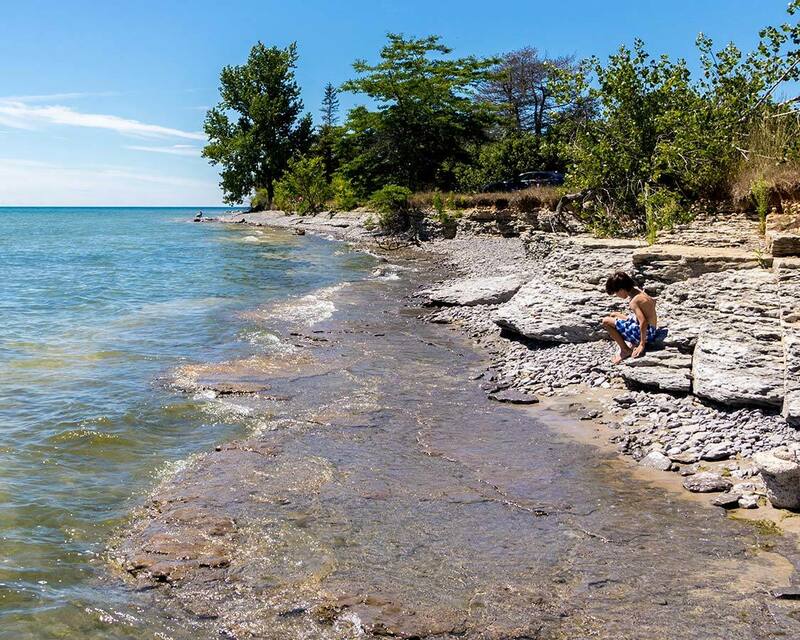 The park is located on the shores of Lake Ontario, the two-hour drive makes Presqu’ile Provincial Park an easily doable beach getaway from Toronto. To get to Presqu’ile Provincial Park, head east on HWY 401 (or via the HWY 407 to 412 toll route if you value time over money). The turnoff from HWY 401 is unmissable. 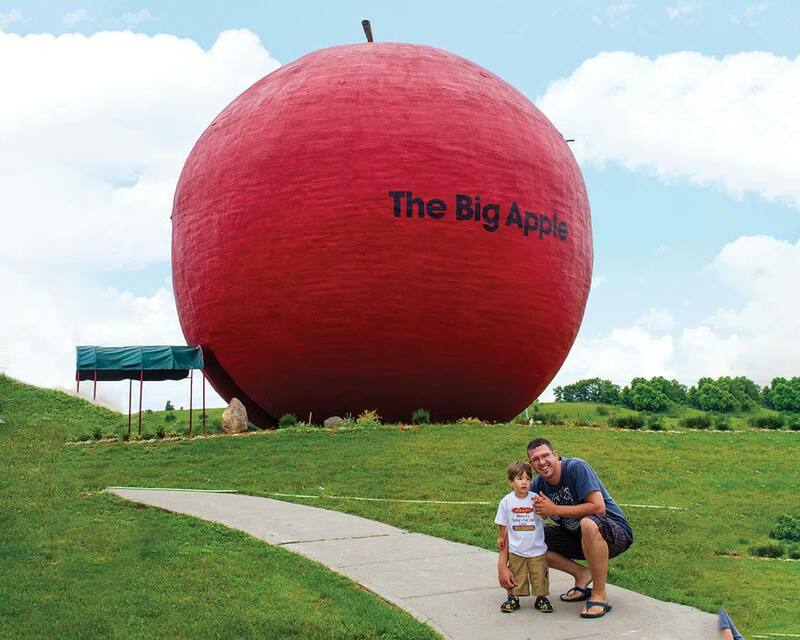 Just look for the giant red apple at the HWY 25 Colborne exit. The Big Apple is a pie factory. It’s a great place to stop and grab some food and a pie to munch on at the beach (Apple crumble is a family favorite). Head south on HWY 25 to HWY 2 and turn left. A Right onto Union Rd. (be careful, it can come up quickly) will take you to Lakeshore Rd. Turn left and follow Lakeshore to Bayshore Rd. On your right is the entrance to the park. The Presqu’ile beaches are a 2.5km of golden sand. The beach at Presqu’ile Provincial Park is long, wide, and divided into three separate entrance areas. Beaches 2 and 3 are open throughout the season, however, Beach 1 often closes due to its proximity to important bird nesting sites. 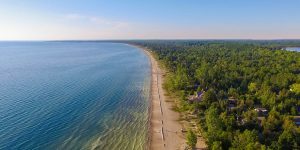 But don’t worry, the rest of the Presqu’ile beach is more than enough to accommodate the crowds that flock here as an alternative to the more popular Sandbanks Provincial Park. Presqu’ile beaches are shallow with a gentle slope. This makes it a perfect beach for families with young children. Average water temperature in the summer of 20C. 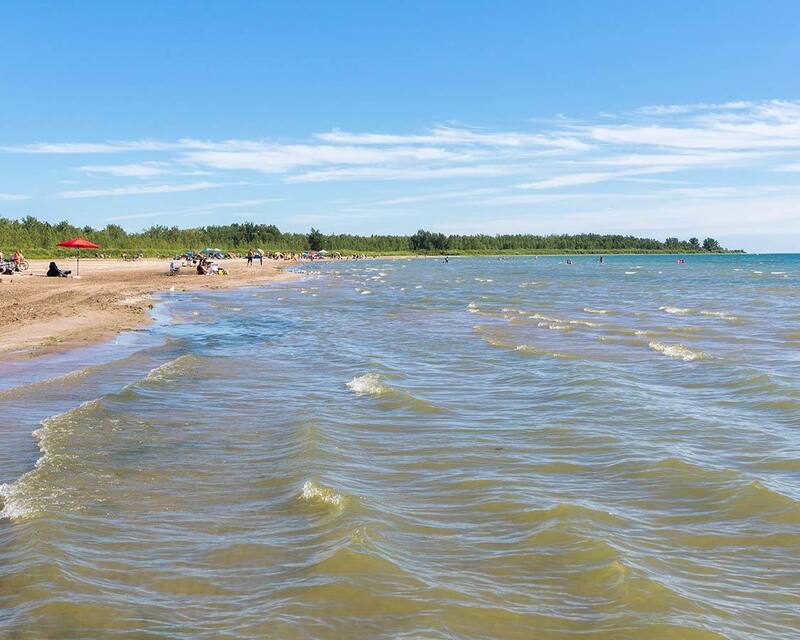 The early summer tends to be cooler, however late summer and into September and early October offer the warmest water temperature at Presqu’ile . There are over 16 km of paths and trails in Presqu’ile . The nature trails and hiking paths wind along the shorelines, through woodlands and across the meadows of the park. The Presqu’ile hiking trails fairly flat and are easy to navigate with children. Towards late summer Poison Ivy is quite prevalent in the park though, so be prepared with long pants, sock, and shoes and wash clothing after hiking. 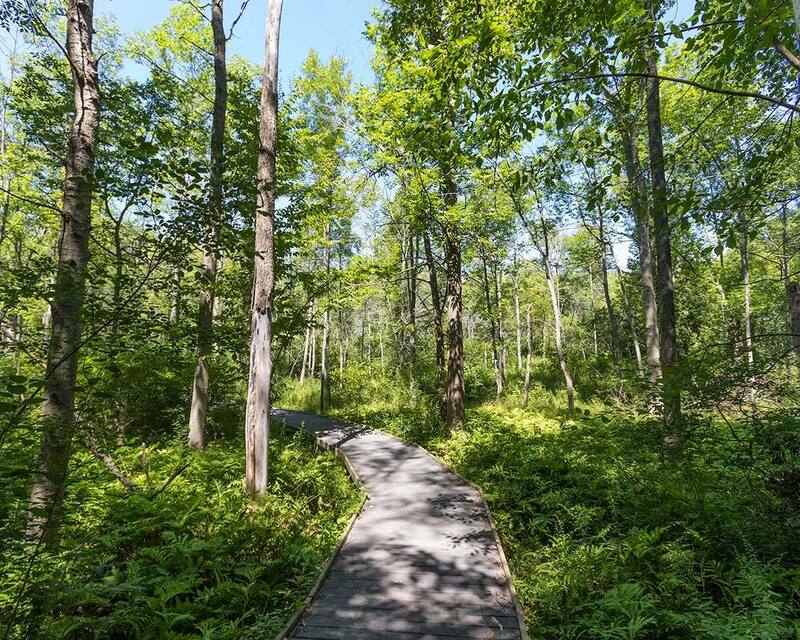 Although the Presqu’ile park marsh boardwalk trail is 1.2 km long with 800 m of boardwalk. This short, easy trail packs in a lot of beauty. 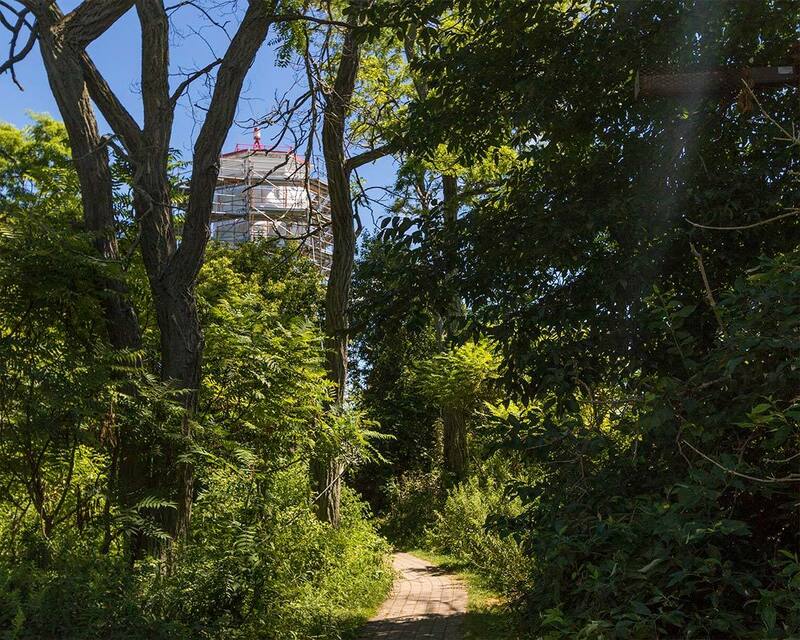 This nature trail is the largest protected marsh on the north shore of Lake Ontario. It offers a very similar experience to the spectacular boardwalks of Point Pelee National Park in southern Ontario. There are two platforms that offer sweeping views of the marsh. There are also panels along the trail that highlight the history, evolution, and wildlife of the Presqu’ile marsh. The marsh boardwalk trail is barrier-free. However, near the end of the trail is a wooded path where you can see some of the unique chair tree’s that have been formed by storms and wind. This trail can get muddy and has roots that might make the use of strollers and wheelchairs difficult. The Owen Point loop is a hit for bird lovers. Although much of this trail is inland or blocked from the water by tall, dense forest and grass, there are a number of lookout points. The isolation of the trail is to ensure that the migrating birds aren’t disturbed, especially during the nesting season. at the end of the Owen Point trail is a great opportunity to see Gull and High Bluff Islands. Access to these islands is closed from March 1-September 10, but outside of that, it’s possible to get to the islands from here. Jobes Woods trail is a great inland trail. It covers the land of what was once a farm settled by Thomas and Ezekial Jobes back in 1835. 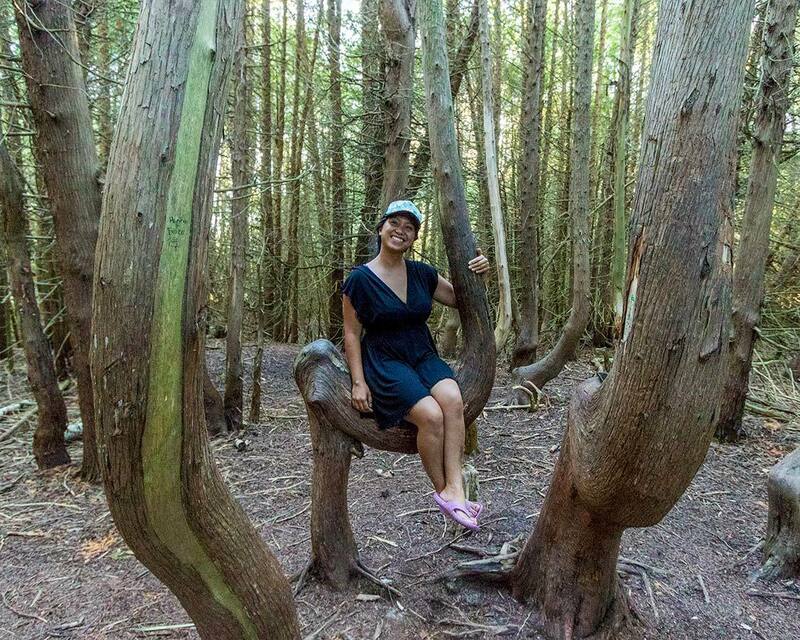 This forest walk has some of the oldest tree’s in Presqu’ile park. Jobes trail is a combination of boardwalk and dirt path. It’s the perfect trail for those looking to isolate themselves and listen to the sounds of the forest. I’ll admit, calling the Lighthouse Foot Path a hiking trail is a stretch. This short path past the interpretive centre takes you to the rocky shore by the Presqu’ile Provincial Park Lighthouse and Lighthouse keepers cottage. The lighthouse itself isn’t one of the most beautiful lighthouses in Ontario, but it is one of the oldest. This lighthouse dates back to 1840. And is the second oldest after the Gibraltar lighthouse on the Toronto Islands. When I was there last in 2018 the lighthouse was under extensive renovation and sheathed in scaffolding. Presqu’ile Park features two visitor centres. 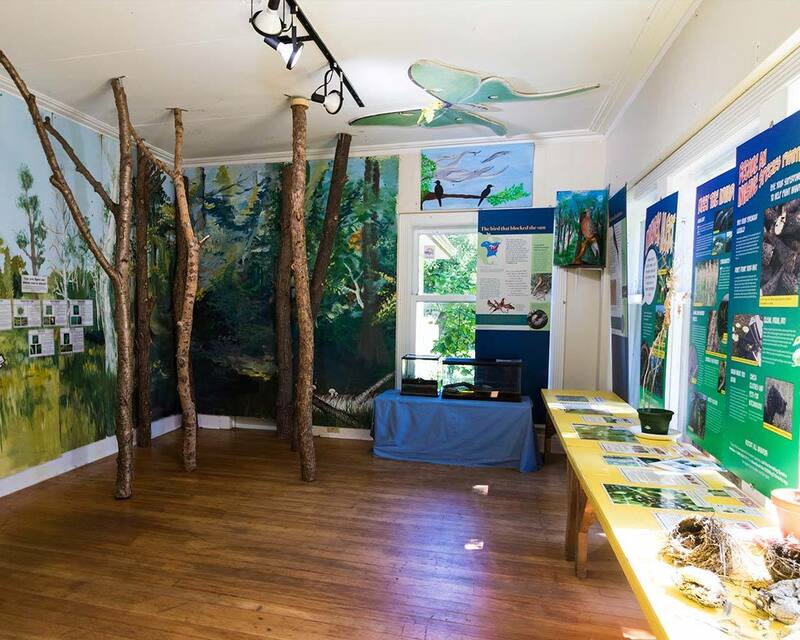 The Nature Centre is open daily during the summer. The Nature Centre is a real highlight for kids. Inside the Presqu’ile nature centre, a naturalist can guide them through various display cases which house frogs, fish, and snakes. Our boys loved scouring for fossils on the beach located behind the Nature Centre. The Lighthouse Centre is also open daily in summer and on weekends in the spring and fall. The Presqu’ile lighthouse centre beautiful displays much of the history of the park, the lighthouse, and the ships that met their unfortunate ends near the peninsula. The lighthouse centre is located conveniently near the lighthouse. There is also a set of binoculars outside that offer a (blurry) view of the remains of one of the island lighthouses off the shore. Gull and High Bluff islands, near the end of viewpoint 5 of the Owen Trail, are breeding grounds for gulls, terns, herons, and cormorants. During the summer access to the islands, or coming within 200m of them is forbidden. The ban is in place from March 10-September 10. But, if you visit with a good set of binoculars, you’ll have no issues seeing the birds flocking around the island. A great alternative to Owen trail is the beach. Many of the birds circle overhead or swoop low over the blue waters. The marsh boardwalk is also a great place for bird lovers to explore. The long marsh grasses are perfect for herons and cormorants to catch small fish and frogs. Lighthouse Lane towards the Lighthouse visitors centre is one of the best spots for having a picnic in Presqu’ile Provincial Park. In fact, it is one of our favourite spots in the whole park for swimming, eating, and just spending a day relaxing in the sun. The flat, grassy picnic spots offer lots of room to run around. there are comfort stations on the inside section of the road. What I love most about this area is the accessibility of the water. It might not be as sandy as the Presqu’ile beach area, but you can often have a section of water nearly all to yourself. 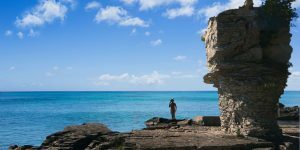 Getting to the water requires a short scramble down the short rocky walls of the shoreline, but the waves are quiet, and the rocky bottom extends quite a ways before it gets too deep for children. Camping season at Presqu’ile is from late April to Thanksgiving weekend in October. During winter at Presqu’ile the park remains open for day visits only. There are winter activities at Presqu’ile including cross-country skiing and snowshoeing along Pioneer Trail, Newcastle Trail, and Jobes Woods Trail. Presqu’ile Provincial Park has eight campgrounds: Trail’s End, Elmvale, Hidden Valley, Lakeside, Craig’s, Maples, Pines and High Bluff. The park has a total of 394 reservable sites and 160 of which have electricity. High Bluff campground tends to have most sought after sites with some of the best access to the waterfront. Pines, Lakeside, Elmvale, and Trail’s End also have fairly easy access on some of the campsites. Hidden Valley, Craig’s, and Maple’s are the furthest from the water, but also among the quietest. For those that would prefer to have roofed accommodation, the park has 3 different choices: the Denson Cottage, an Exploration Tent (site 155 on Maples campground), and the Minka test site (site 12 in High Bluff Campground). However, although the camp is open year round, the roofed accommodation is only available during the summers. Pro-tip: Firewood, essential groceries, and ice cream are available at the camp office. Firewood is also available at the main gate. If you plan on spending a long weekend at Presqu’ile or more. There are numerous attractions within an hours drive of Presqu’ile that will be sure to keep you busy. The quaint town of Brighton is less than a 10-minute drive from the Presqu’ile campgrounds. This quiet town is perfect for antiquing, grabbing a nice lunch or dinner out, or just window shopping. If you visit during September or early October, head over to Cricklewood farms and pick some fresh apples. 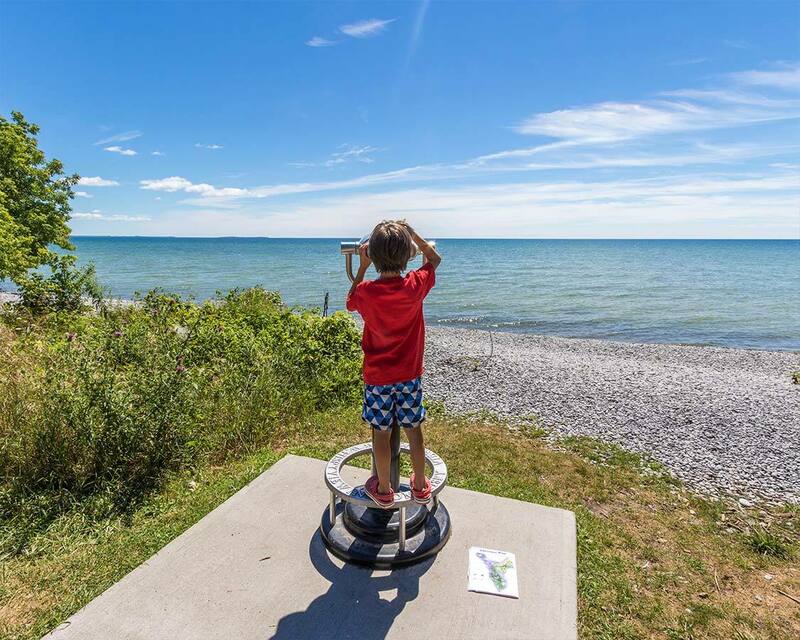 Kids will love the Memory Junction railway museum, and the Goodrich-Loomis Conservation area is a wonderful spot to experience a different type of nature than that offered at Presqu’ile . One of the best wine regions in Ontario is just a 40-minute drive from Presqu’ile Provincial Park. Prince Edward County is a popular destination for cheese-lovers, craft beer aficionados, and those who love relaxing drives through some of the most beautiful rolling waterfronts in Ontario. 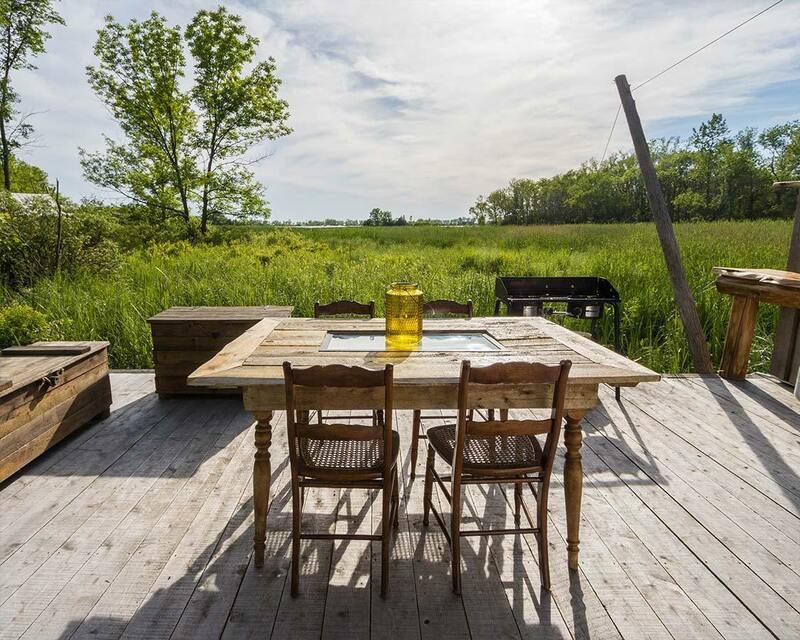 And if camping at Presqu’ile isn’t for you, you can always try glamping at Fronterra farms in Prince Edward County. Heading inland 45 minutes from Presqu’ile will take you to Ferris Provincial Park. 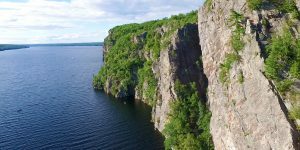 Here you can take in the views of Ranney Falls or walk the picturesque suspension bridge over Trent River Gorge. 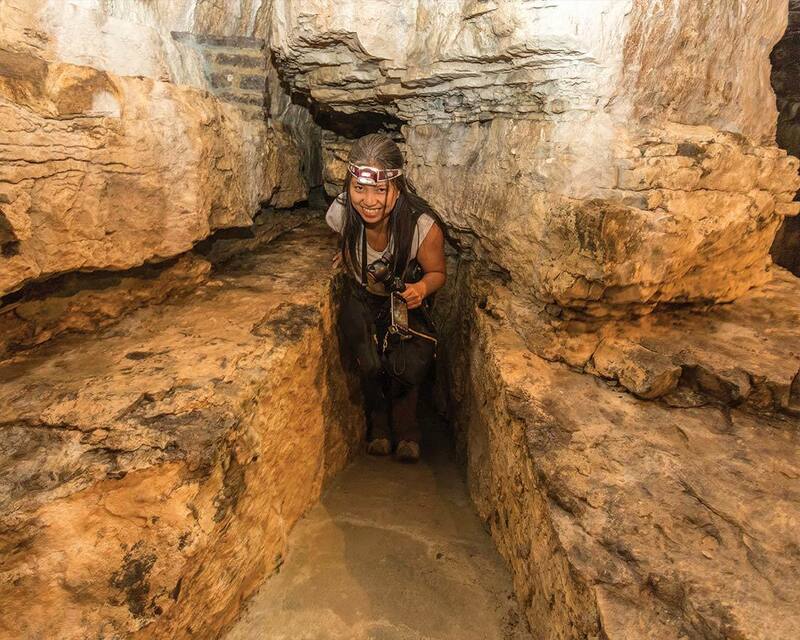 45-minutes up HWY 401 is one of Ontario’s underground wonders, Tyendinaga Caves. This small but fascinating Ontario cave has graffiti dating back hundreds of years from explorers who have dared to wander into it. Presqu’ile Provincial Park is one of our favourite parks for short trips and weekends with children. The small size of Presqu’ile makes it easily manageable. 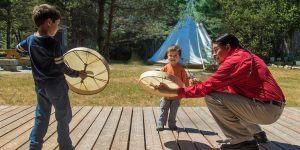 And the wealth of activities and daily interpretive programs in the summer help keep kids fascinated about nature, history, and Ontario’s magic. 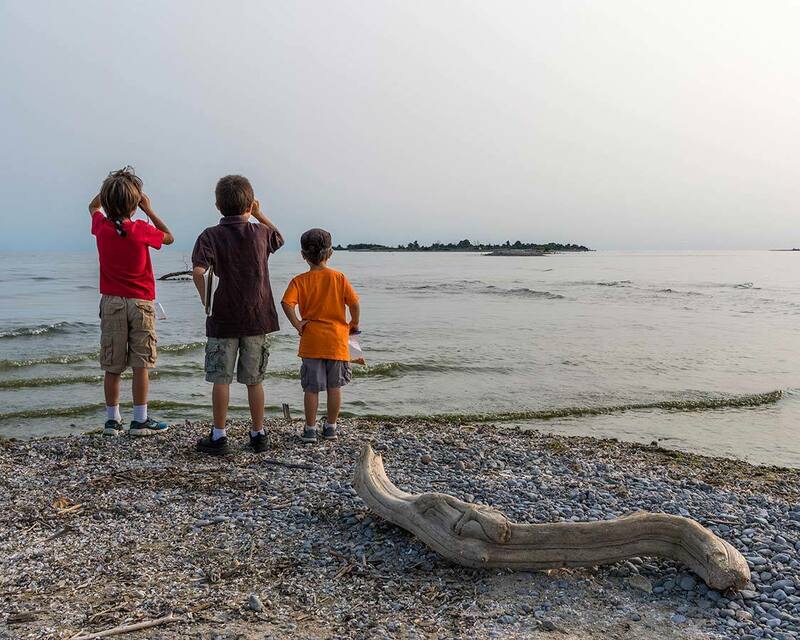 Visiting Presqu’ile with kids is easy, fun, and offers one of the best combinations of family-friendly outdoor activities in central Ontario. Have you ever been to Presqu’ile Provincial Park? Tell us about it in the comments below. Or, visit our Facebook Page and share a photo of your experience. We would love to share in your travels. Disclosure: We want to thank Ontario Parks for making this post possible. Wandering Wagars is a participant in the Amazon Services LLC Associates Program, an affiliate advertising program designed to provide a means for sites to earn advertising fees by advertising and linking to amazon.com, amazon.co.uk, amazon.ca. Amazon and the Amazon logo are trademarks of Amazon.com, Inc. or its affiliates. Despite having grown up in the province, I haven’t spent nearly enough time in this part of Ontario. Time to return! Love Presqu’ile Park. Perfect for a family camping trip. We do too! Such a fun place to stay and explore.